Hola (pronounced HO-lah) is a card game for two or four people. The game seems to have originated in the Ukraine. Hola is popular in central Canadian cities like Winnipeg and Regina where there are many people of Ukrainian origin. Hola is a card game for 2 or 4 people. It’s most fun when played by 4 people as a partner game. The goal is to score more points than your opponent. If you take all of the points, you score “Hola”. There is no additional point value for scoring “Hola”. It is strictly a matter of pride for the winner and humiliation for the loser. Hola uses a standard deck of 52 playing cards. Deal 4 cards to each player. Leave the remaining cards in the center of the table as a stockpile. 2s and 7s are wild cards. 10s and Aces are the only cards that have a scoring value. They are worth 10 points each. All other cards, including the wild cards, are worth 0 points. Player 1 plays a 9. Player 2 plays an 8. Player 1 takes the trick. Each player then draws one card from the stockpile to replenish their hands and the winning player will start a new round. Player 1 plays a 5. Player 2 plays a 5 to take control. Player 1 cannot or decides not to fight and Player 2 takes the trick. Each player draws one card from the stockpile. Now Player 2 leads. Player 1 plays a 10. Player 2 plays a 10 to take control of these valuable point cards. Player 1 plays another 10 to regain control and fight for the points. Player 2 plays a 7 (wild card) to retake control. Player 1 plays a 2 (wild card) and retakes control. Player 2 has no more 10s or wild cards so plays a 3. Player 1 wins the round and takes the trick scoring 30 points (10 points for each 10). The players replenish their hands with cards from the stockpile and Player 1 leads the next round. Play continues until are cards have been played and the stockpile is exhausted. 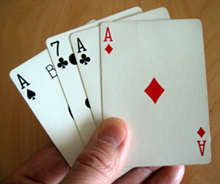 There is a possible 80 points available in each deck played since there are 4 10s and 4 Aces, each worth 10 points. All other cards are worth 0 points, including the wild cards. Players usually play until they reach some predetermined score, such as 500 points. Use a pen and paper to keep score. The lead player generally should not lead with point cards (10s or Aces) unless prepared to fight 3 or 4 rounds to ultimately take the points. The non-lead player has the advantage of playing last card. For example, the lead player would want to play a 10 if he also had another 10 and two 7s (wild cards) to back it up.